At this year's Greater Edmonton Teachers' Convention (GETCA) I went to see Kathy Cassidy's session called "Connected From the Start" which is also the name of her book, which covers the same topics. Like many teachers who use technology in class, Kathy uses a wide variety of technology devices and applications. Her classroom has one-to-one iPads. Her session had three main sections: Skype, Blogging and Twitter. I reviewed each section in a separate blog post, this is the final review. Kathy Cassidy has her own personal Twitter account as well a class Twitter account which is used year after year with her class. Her students are usually the ones composing the tweets on iPads. She also types what students share. Sometimes it is a combination of students composing and Kathy adding clarifying spelling in brackets. 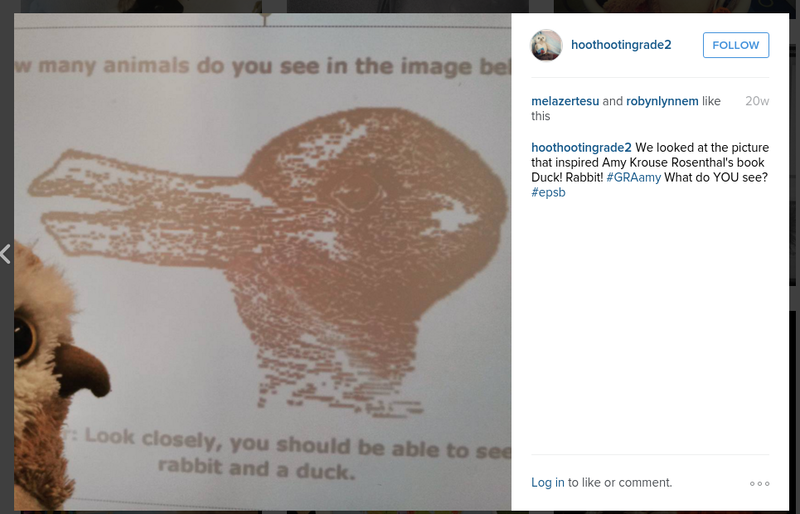 Her students tweet class events, tweet what they learn and sometimes tweet about specific topics using hashtags (#). Her students usually combine their tweets with pictures. This is where having iPads/tables is useful. The rule in her class is to show Mrs. Cassidy before you tweet. She shared a humourousf story about when a student did not show her prior to tweeting on purpose. A Twitter follower alerted her to the inappropriate tweet and reminded the class that the "world is watching". This event would often turn people off of letting young student have access to Twitter in the classroom. She shared how she used this as a digital citizenship learning opportunity for that child. She recommended that you do not use your personal/professional account for class tweeting. 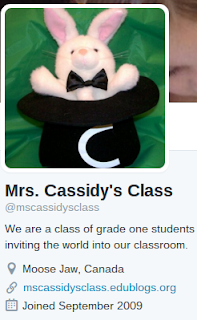 She suggests limiting which Twitter accounts your class account follows to only Kid-friendly Twitter accounts. 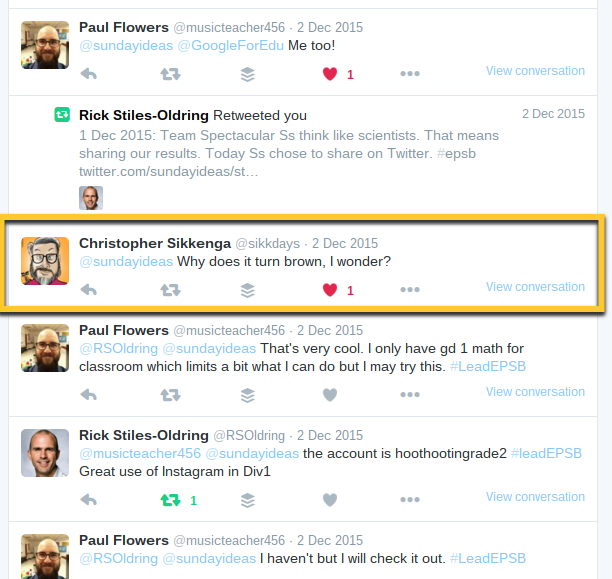 I use Twitter for developing and strengthening my Professional Learning Network. I use it to find ideas and educators to inspire me. However have not used Twitter much with my class (until this year). 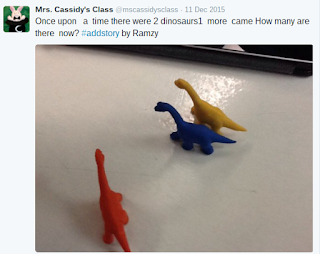 I have watched other teachers use class Twitter accounts but did not feel that the practice would enhance my students' learning experiences as using Twitter with younger students felt somewhat superficial, from my perspective. Seeing how Kathy has students logged into Twitter on iPads helped me see how having a class Twitter account can be child centred. One I idea Kathy shared that I really like is the possibility of using Storify for a class Twitter account. Storify helps you create stories or timelines using the content you create on Twitter (and other social media). 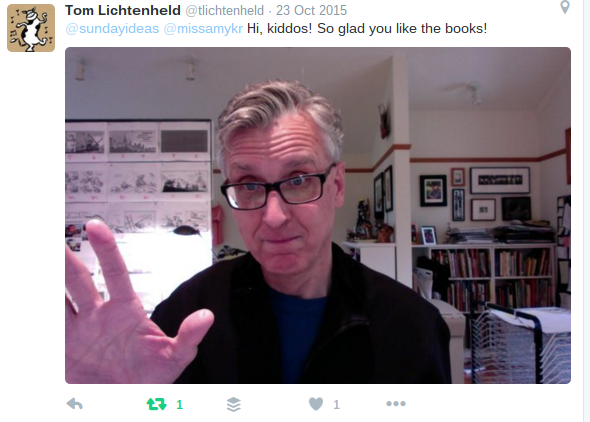 This year I started using Twitter with my class via my own account because we participated in the 2015 Global Read Aloud. My students tweeted questions at author Amy Krouse Rosenthal and illustrator Tom Lichtenheld. Both replied and my students were excited to get a special hello from Tom. smaller scale. I have one device (an old smartphone of mine). As I have become more comfortable and confident with using it in class, I have allowed my students more independence with composing (sometimes using voice typing) the text. I will often share the Instagram post on Twitter if we have added a hashtag. So I can see the benefit of having a class Twitter account to support our Instagram account. put what we learned on SchoolZone (EPSB's secured information bulletin board for parents and students). The few times I did use Twitter this year with students, they wanted to know if anyone had replied or responded. I had to scroll through my other notifications to get to the replies. The adjacent tweets each time I did this were benign but it was distracting for the students. This is when I realized the importance of having a dedicated school or classroom account. You would never have to worry about what other tweets were on your feed that you did not want posted on a Smartboard. So as you can see even before I went to Kathy's session at GETCA I was already beginning to lean toward creating a classroom Twitter account. I would say her session solidified this decision for me. However, I still have some things to think about before I do. Will I create a unique account for each school year? My students come up with a classroom name. I try to avoid calling anything "Ms Mondor's class" but prefer to use the unique class name to build student ownership of creating our classroom climate. On the other hand, building followers to make Twitter impactful takes time. Having a strong base of followers at the start of each year would be ideal. Similar to my first questions, what will happen if I change grades or schools? Will my classroom Twitter account follow me or will I start a new one for a new school/grade? Am I willing to have a device (or more, I do have access to a few tablets at my current school) permanently logged into Twitter for students to use? I already do this with Instagram but I am the one the hands the Smartphone to students to take Instagram photos rather than having it available for when they decide they have something important to share. 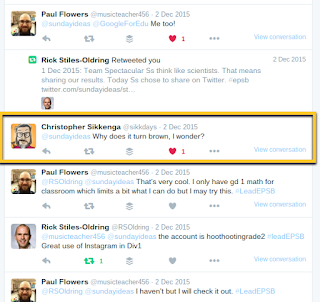 Related Div1 Edtech in EPSB blog post: So I Joined Twitter. Now What?